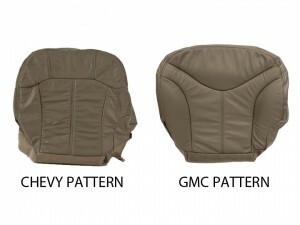 Here’s the deal…When you are looking to replace a leather seat cover in a 1999-2002 Chevy Silverado and a GMC Sierra, be sure you are buying the correct stitching pattern. GM ran two different patterns in the GMC Sierra. Most of the time in the Sierra, GM ran the “Chevy” pattern (shown on the left in the picture below). However, some of the Sierra’s have the “GMC” pattern (shown on the right in the picture below). The VIN will not tell us which stitching pattern was used in the vehicle, so make sure you compare your seat with the patterns shown below. If you have any further questions about how to determine the pattern in your truck, or questions about any of our replacement leather seat covers, give us a call at 214-710-2565.